Public Ad Campaign: The PublicAccess Project is Online! The PublicAccess Project is Online! Over the past year, I have been slowly working on a project that I call PublicAccess. While the project is ongoing and will continue to grow over the coming years, the website is finally finished and ready for users. PublicAccess is a participatory open source project and we hope you get involved. Nearly every major metropolitan city has an active bus or trolley system. Over the years, this vital public service has become an integral part of the global outdoor advertising industry in the form of bus shelters and other municipal infrastructure. 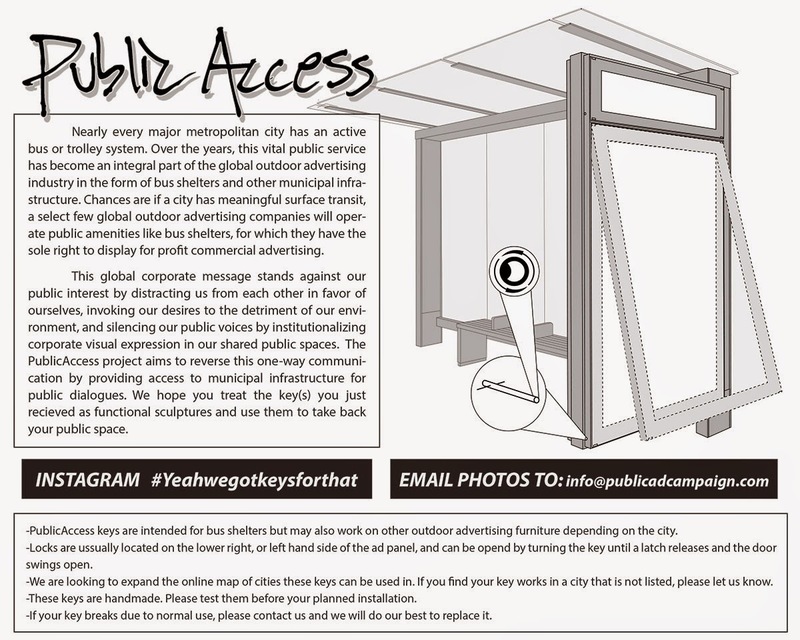 Chances are if a city has meaningful surface transit, a select few global outdoor advertising companies will operate public amenities like bus shelters, for which they have the sole right to display for profit commercial advertising. This global corporate message stands against our public interest by distracting us from each other in favor of ourselves, invoking our desires to the detriment of our environment, and silencing our public voices by institutionalizing corporate visual expression in our shared public spaces. The PublicAccess project aims to reverse this one-way communication by providing access to municipal infrastructure for public dialogues. Artists and individuals can treat the tools offered through this site as functional sculptures to interject their thoughts into our shared public spaces. PublicAccess is an ongoing project. We are looking for ways to expand this map, and the tools we can offer. If you do not see your city, or if you can help us fill in this map more accurately, please email us at info@publicadcampaign.com.